Overbaking will cause your cake for dogs to split on the top, dome up, shrink, become dry and crumble, or develop holes throughout. Set a timer and stick to it. Test the cake for doneness as you approach the end of the allotted time. When a fork or toothpick comes out clean, the cake is done. Overbeating can cause splitting or doming as well. Follow the recipe as written. There is a reason certain ingredients are put into a recipe. Using less water or oil or leaving out an egg can cause a cake to come out too dry or to fall apart. Extra ingredients may cause the cake to fall or become soggy. For example, if you are including fruit, be aware of the juice. This will add more volume to the liquid content so be sure to adjust accordingly. If baking pumpkin dog treats, be careful to use the canned pumpkin and not the pumpkin pie filling which contains a lot of unnecessary sugar. Keep the cake for dogs in the oven until done. When testing for doneness, do not pull the cake out of the oven. Check it as close to the edge of the oven as you can. You want it to stay cooking evenly in the heat. This will happen with too much water or oil put into the mix, the cake pan is too large, the cake is underbaking for too low an oven temperature, or over/underbeating of the ingredients. Avoid the cake running over the pan. This will happen if you fill the pan too high. For best results, fill about half full. Make sure the cake pan is placed in the center of the oven on a level rack. Find more tips to bake a dog cake to ensure that your cake comes out looking like it was baked by a professional cake baker! Find out why certain ingredients are used and some are avoided if you wish to bake a cake from scratch. 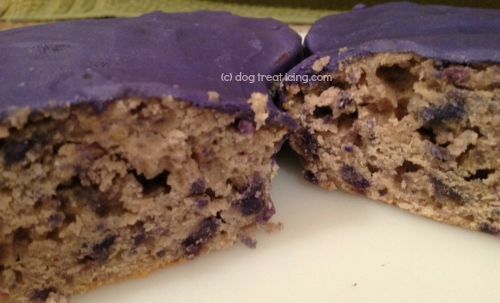 Just click here: Dog Cakes. Learn about the differences in flour types, and alternative ingredients to substitute for eggs or fat.